It’s been a tough road for the U.S. farming industry, which is seemingly beset on all sides. Agricultural commodity prices remain low, with spot corn and soybean currently fetching $3.62 and $8.99 per bushel, respectively, each roughly 22% below their respective 10-year average prices. Meanwhile, the ongoing Sino-American trade war continues to crimp overseas demand, as the U.S. Department of Agriculture reports that soybean deliveries to China fell more than 80% year-over-year since September. That helped push soybean stocks to a record 3.7 billion bushels as of year-end 2018. By the same token, the USDA forecast Friday that corn plantings will rise 4.1% in 2019 to 92.8 million this year, an unwelcome development considering that “American silos are already bulging with the grain,” according to Bloomberg. Adding insult to injury, devastating floods have afflicted large swaths of the Midwest during the heart of spring planting season. The USDA estimates that net farm incomes plunged 16% year-over-year in 2018 to $63.1 billion, down from more than $120 billion as recently as 2013. Rising operating costs play a prominent role in that shrinkage. 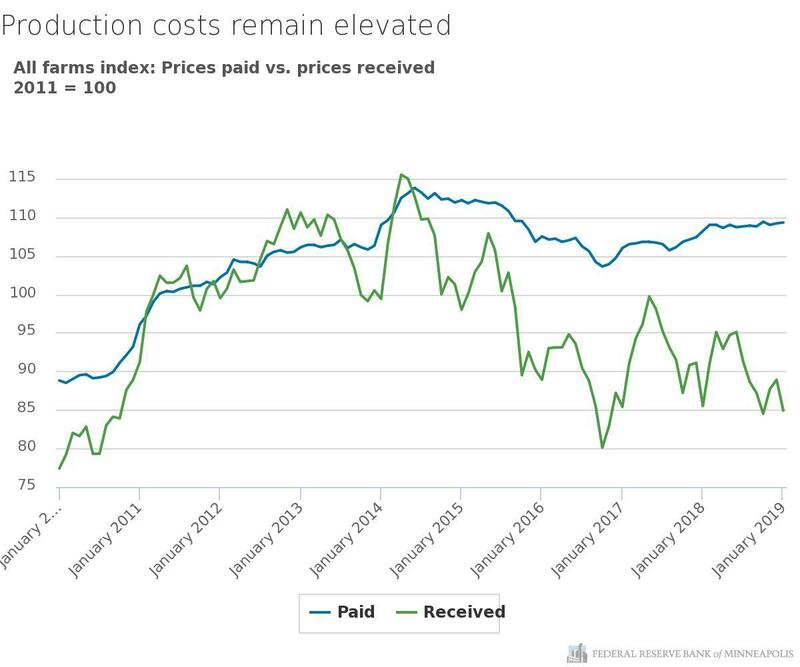 According to the All Farms Index tabulated by the Federal Reserve Bank of Minneapolis, the prices received component fell to 84.9 in January from 95.1 in June, while prices paid registered 109.3 and has remained north of 100 since 2011. Things are particularly grim in Minnesota and surrounding states. The Minneapolis Fed reports that in-state farmers have seen total input costs for seed, fertilizer, pesticides, fuel and electricity rise by 50% since 2006, after adjusting for CPI-measured inflation. As a result, Minnesota farmers reported real median net income of $26,055 last year, down 8% from 2017 and the lowest figure since the early 1980’s, per an estimate from Dale Nordquist with the University of Minnesota’s Center for Farm Financial Management. Unsurprisingly, that one-two punch is leading to increasing distress. The Minneapolis Fed reports that the ninth district (encompassing Minnesota, Wisconsin, North and South Dakota and Montana) has seen farm bankruptcies rise to more than 100 in the 12 months ended in December, up from 46 in calendar 2015. The flooding is currently a localized disaster for those producers in areas affected. Can this become sufficiently widespread to have a true impact on U S production of row crops? The answer is a resounding yes, but it is too soon to make that statement. Early planting is a boon to yields and, given relatively depressed prices, it is easy to imagine farmers making extensive use of crop insurance policies if things get very late. I think we need to revisit this in 2.5 weeks to see how conditions have changed (or not) as snow melt and runoff and rain or lack thereof play themselves out over this period. In summary, some notable areas are experiencing great misfortune but it is not yet a “national” story. China will be an increasingly aggressive buyer of pork around the world yet is not the only place experiencing the spread of this particular disease. . . China is restricting imports from Vietnam to try and preclude a more aggressive disease spread. North America, probably thanks to distance and very advanced containment regimens, seems pretty safe now. North America should have an expanding hog population and expanding exports. With cheap feed, it’s a pretty good business to be in.